Dream Stele-(detail of lunette); reproduction at Rosicrucian Egyptian Museum, San Jose. 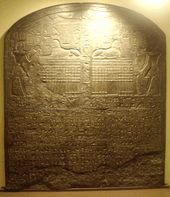 The Dream Stele, also called the Sphinx Stele, is an epigraphic stele belonging to the Ancient Egyptian Pharaoh Thutmose IV. It was erected in the first year of the king's reign, 1401 BC, during the 18th dynasty. As was common with other New Kingdom rulers, the epigraph makes claim to a divine legitimisation to pharaohship. "Now the statue of the very great Khepri [the Great Sphinx ] rested in this place, great of fame, sacred of respect, the shade of Ra resting on him. Memphis and every city on its two sides came to him, their arms in adoration to his face, bearing great offerings for his Ka. One of these days it happened that prince Thutmose came travelling at the time of midday. He rested in the shadow of this great god. [Sleep and] dream [took possession of him] at the moment the sun was at zenith. Then he found the majesty of this noble god speaking from his own mouth like a father speaks to his son, and saying: "Look at me, observe me, my son Thutmose. I am your father Horemakhet-Khepri-Ra-Atum. I shall give to you the kingship [upon the land before the living]....[Behold, my condition is like one in illness], all [my limbs being ruined]. The sand of the desert, upon which I used to be, (now) confronts me; and it is in order to cause that you do what is in my heart that I have waited." "
The Dream Stele is a vertical rectangular stele, 360 cm Ht, 218 cm W, 70 cm D. The upper scene lunette, shows Thutmose IV on the right and left making offerings to the Great Sphinx. Recently a surgeon at Imperial College London (Dr Hutan Ashrafian) has analysed the early death of Thutmose IV and the premature deaths of other Eighteenth dynasty Pharaohs (including Tutankhamun and Akhenaten). He identifies that their early deaths were likely a result of a familial temporal epilepsy. This would account for the untimely mortality in Thutmose IV and can also explain his religious vision described on his Dream Stele due to this type of epilepsy’s association with intense spiritual visions and religiosity. ↑ Shaw, 2000, The Oxford History of Ancient Egypt, p.254. ↑ Ashrafian, Hutan. (2012). "Familial epilepsy in the pharaohs of ancient Egypt's eighteenth dynasty". Epilepsy & Behavior. 25 (1): 218–9. doi:10.1007/s12020-011-9581-z. PMID 22169966.